Should You Buy the 2017 Mitsubishi Mirage? You Are Here: Home > Should You Buy the 2017 Mitsubishi Mirage? The new Mirage is getting rave reviews, and the 2017 seems to be a new favorite. More technology for the same price, fuel economy that often beats the EPA estimate, and improved performance are all factors consumers love about the new Mirage hatchback. The 2017 Mirage comes with available Apple CarPlay and Android Auto, giving you some of the most advanced and convenient auto infotainment technology on the market. Despite the fact that the Mirage is one of the smallest in its segment, it has a spacious interior, four doors for easy backseat access, and plenty of rear cargo space with 60/40 split fold seats. The Mirage is known for being one of the most efficient non-hybrids on the market and was named the Most Affordable Car on the Road in 2015 thanks to its low price and operating costs. While the EPA estimate is 37 mpg in the city and 43 on the highway, many drivers report much better mileage, usually in the high 40s and even low 50s when driving on the highway. If good gas mileage and driving an ecofriendly car is important to you but you’re on a tight budget and can’t spring for a hybrid, the Mirage is perfect for you. 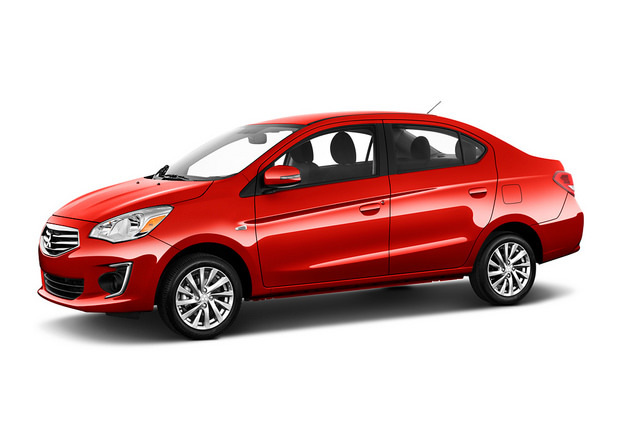 Whether you’re looking for an energetic subcompact you can drive comfortably in the city and parallel park with ease or you just want something cheap and efficient with lots of technology, you’ll love the 2017 Mirage.